Watch the interview clip now! Watch the Playgirl video now! Watch the Seventeen video now! 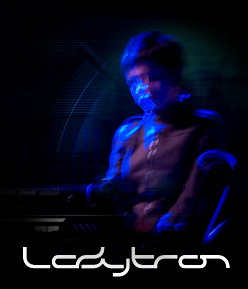 Ladytron (LT): (Rueben - Rbn) I'm Rueben and I play keyboards. (Mira) I'm Mira, vocals & keyboards also. Video Vision (V V): How did you guys meet? Who met who? What was the idea behind Ladytron when you first met up? LT: (Rbn) I kind-of knew Danny in Liverpool, we're both from Liverpool... basically from seeing each other in the same clubs and shops in Liverpool. Later we met up with Helen, who was a music student at Liverpool University. And later we met up with Mira through a mutual friend. V V:: Is there a standard process in your creative process? Does one person write the lyrics and another write the music or is it all collaborative? LT: (Mira) With 604, our first record, that was primarily done by Danny because he handles the Freddy. With this one ("Light and Magic") it's a lot more collaborative but there's no standard process. Every song comes out differently. VV : Was the succes of "604", an unexpected surprise? Had you planned on continuing on with Ladytron after you made that album? LT: (Rbn) We didn't really know what to expect at all when we were making that album. At the time we all had full-time things that we were already doing. V V: So it started more like a side project? LT: (Rbn) Well, not really, but... (Mira) It was more like taking things one at a time, and just seeing what happens. (Rbn) It was something that was just there. We never thought that it was, that we were, going to get to a certain place, it just happened. So in a way it was very surprising. V V: Rueben, I've seen you do a DJ set here in SF at the Cat Club. It seemed influenced by Ladytron, but you also did other stuff with a different style than Ladytron. Do all four of you continue your own side projects? LT: (Rbn) We all DJ now, and we all play different music. So it's always interesting to hear what each of us (individually) have to play. And also to have a look at the difference between the first record and the second record and hear all of the new combined elements in there now. V V: Do you see Ladytron as your main gig though? LT: (M, R) Yeah, there's no time for anything else now. (Mira) We come off tour on Monday and we're in London for a four day break, but during that time we have to go to Paris, and after four days we start a new European tour. There's not enough time to do your laundrey let alone start another band. (Rbn) We may as well just sit on the tour bus (for 4 days) and just wait for it to begin again. V V: Are you happy with that right now? LT: (Cato) Yeah ! We're very lucky, it's a very good thing to do. V V: Regarding artists and image, do you feel it's necessary to label music with a certain style or name? For instance, the music magazines are calling Ladytron "the next best group in electro synth pop". Do you think categorizing music is useful or just a marketing ploy towards the consumers? LT: (Mira) Well it's categorizing by the media or an industry for a marketing ploy, and definitely not categorizing by the band. There's no need to narrow yourself down in any way, and putting labels (on the band and music) really narrows you. Plus, we've always just done our own thing, and never been the "next thing" in anything. We don't know what we're going to do. (Rbn) Categorizing can helpful to the extent that it gives a new-comer pointers to new bands, labels and influences. But it gets taken a bit too far when people say "ALL THIS" equals one thing, and that's when it gets a bit frustrating. V V: I read an interview which expressed surprise that Danny is interested in soccer... I suppose there was a surprise because it didn't fit in the image of the band. LT: (Mira) But that's some kind of image that people have imprinted on us. (Rbn) It is weird... it's stuff which is absorbed by the media which is reabsorbed into us and it becomes this never ending circle... (Mira) You have to face up to things which are said about you all the time and it's... (Rbn) We're always reading things which are written about us and it's... (Mira) It's funny. (Rbn) Yeah, it's funny. LT: (Mira) No! Not at all. (Rbn) If anything, it makes it more exciting really. (M) And it makes us want to break that image a bit more, really. V V: So about your music videos... With your video for Seventeen, the director, David Chaudoir, was there a lot of collaboration between the band, and the director and the concept for the video? V V: When you saw it for the first time, did it trigger something in you similar to when you created the song like "this is what I saw it as"? LT: (Mira) We do everything for the day. And every time we play "Seventeen" or hear it, it becomes a different thing, because it's in a different situation. So it's not about nostalgia because every time you hear it you feel something different about it. So when we recorded "Seventeen", we were just having a laugh while we were doing it rather than thinking how it would look or feel later on. V V: What do you think about music videos? Do you see them as a necessary promotional tool for bands trying to survive or even make it? LT: (Rbn) I don't think it's a necessary evil. It's going to be an even more important part of songs... music that can be bought by people. With all the issues regarding piracy, I think the record companies need to start thinking about putting more value into what people actually buy - what they take home, rather than just the music itself. (Mira) It's also really great because most musicians are really visual and it's great to be able to play around with it as well, so it's good fun for musicians. V V: Given that there's only four lines in Seventeen, was that a primary concept for the video, to reflect that sparseness? LT: (Mira) Yes, the sparseness of the video is very much linked to the sparseness of the song. But it kind of grows in a different way... like we came up with four lines which we thought were strong, so there was no point in putting other stuff around it. V V: Your work with Interpol, and the remix of Blue Jeans - is that true that it's only going to be a UK release? How did that come about? LT: (Rbn) For now it's only for UK release, we're not sure about the US. We just hooked up with them somehow, befriended them. When we get some free time (haha) we're going to do the remix of their song. We're not sure which one, we'll see. V V: Is there an instrument or kind of keyboard that you could call the base of the Ladytron sound? LT: (Rbn) I use an MS-10, because I tend to play more bass lines live. (Mira) I use the MS-20 all the time. Everyone uses something different. V V: Do you tend to experiment more when you're in the studio or playing a live show? What's the major differences between playing live and studio sets? LT: (Rbn) I think we experiment quite a bit more when we're jamming on stage. Because after playing them so much, you get to know songs really well, so you start to explore and experimenting with them. And you end up thinking, "that could be a new song... "
VV: Do you read the audience at all when you're experimenting or (are you) into your own thing? LT: (Mira) It's more like being into your own thing, and how you feel. And it depends what kind of sound you're getting from the stage; sometimes you'll hear new things from that place, or you can make a mistake and like it. V V: Mira, you were studying genetics at Oxford? Are you still doing that? LT: (Mira) I was writing up, but it's kind-of taken a back seat. I haven't written anything for six or seven months. (Rbn) You shouldn't be saying that on TV? (Mira) My professor's too busy reading papers to watch television. © 2002 Evans Media Group, Inc.